Unwavering service, Mobil Lubricant supply and first class technical support since 1972. For a second consecutive year, Burke Lubricants was awarded this prestigious accolade, further reiterating our continuous indomitability as a company and proving that we go from strength to strength over the years. Every year, ExxonMobil scours the planet in search of absolutely unyielding performance excellence in several leading sectors. Our dedication to service excellence in the lubricants industry was recognized by ExxonMobil after a series of stringent tests and process monitoring and we are proud of this world-standard acknowledgement. Established as the world's largest publicly traded international oil and gas company and the founder of an illustrious group of derivative companies, ExxonMobil is undoubtedly the pioneer in developing optimized fuel-efficient solutions and products. Winning the '03 ExxonMobil Ireland Distributor of the Year award set Burke Lubricants in a league of superior service delivery and exceptional quality standards. Mobil 1, a premium product from ExxonMobil and the official lubricant of several world-famous rallies and races, have awarded Burke Lubricants an exemplary award for a quarter of a century of performance excellence. 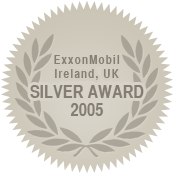 We are proud to be one of the few names in the international fuel and lubricant industry to have earned this accolade. Burke Lubricants developed a new sales pipeline and customer relationship management system, called Sale Sync Pipeline, which was instrumental in generating 23% volume growth in 2015.